In this Webinar learn how to use our fault, performance and configuration management tools to improve your IT security posture. Our solutions help manage and monitor network devices and their configurations to enhance risk management, IT security and compliance. Discussions will include simplifying day-to-day operations, increasing automation, and generating reports to verify compliance and highlight violations. 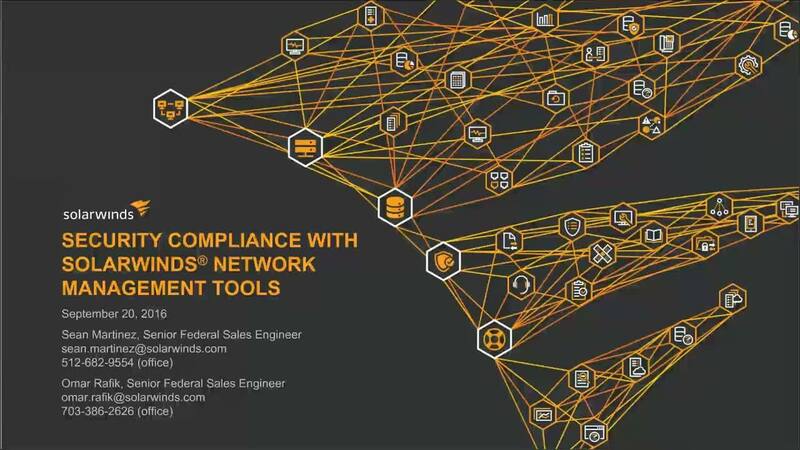 Our federal Sales Engineers review and demonstrate how our tools can help achieve and maintain RMF, FISMA and DISA STIG compliance. Configuration management helps agencies develop, deploy and maintain compliant configurations. Fault, performance, and log management help ensure that devices are continuously monitored and operating correctly. And patch management automates patching to reduce vulnerabilities.